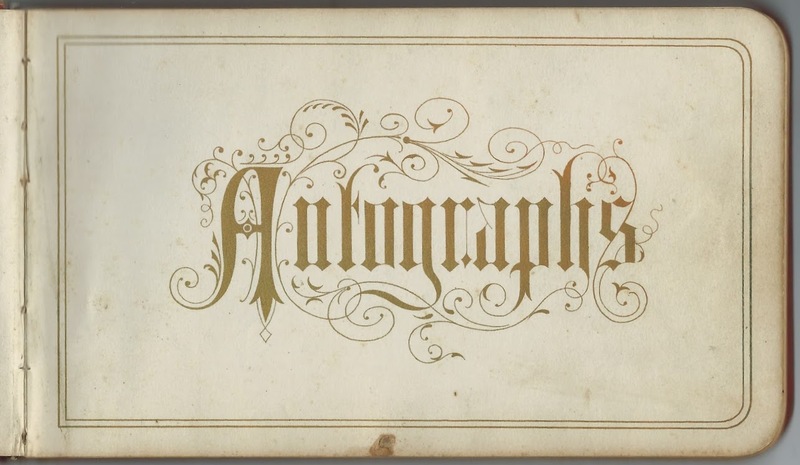 1879-1890 autograph album that belonged to Minnie Robinson of Frankfort, New York, and, later, Black River, New York. The album was presented to Minnie by Louise on September 10, 1879. The album measures approximately 7" x 4-1/4" and contains the sentiments of 59 of Minnie's relatives, friends and schoolmates. An alphabetical surname list and an alphabetical list of signers, together with any personal information they offered, appear at the end of this post. Minnie Robinson was born about 1867 in New York, the daughter of Rev. Lafayette H. Robinson and his first wife Celestia A. (Fassett) Robinson. 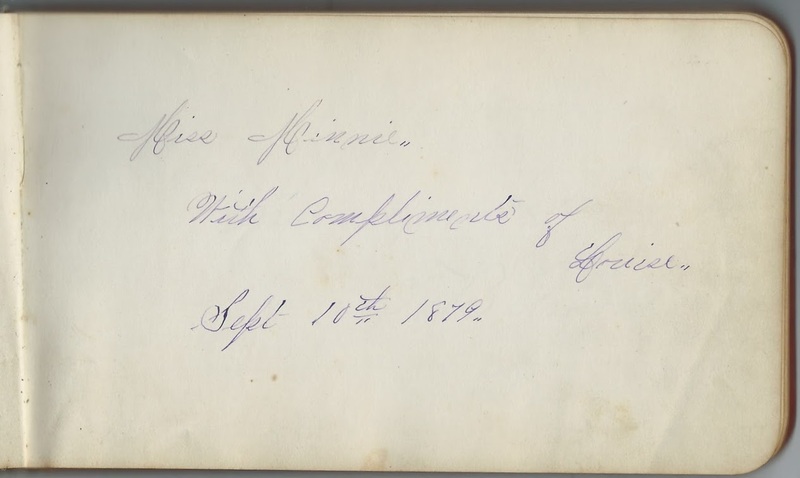 They each signed pages in Minnie's album, her father at Oswego City, on April 6, 1880, and her mother at Frankfort, New York, on March 7, 1881. 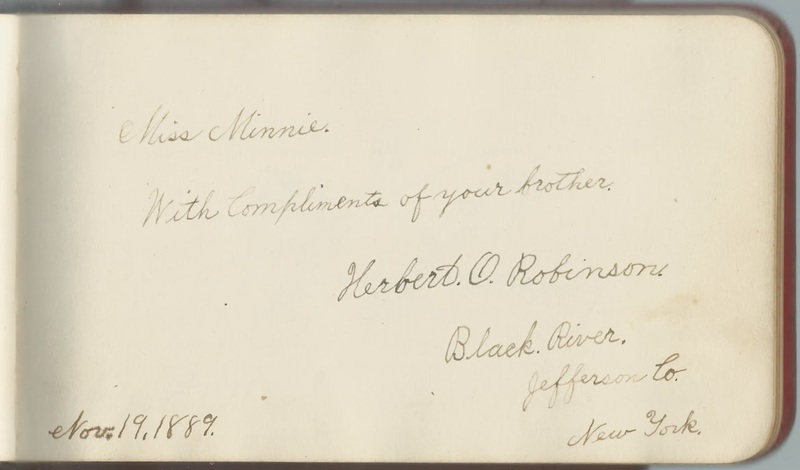 Minnie's brother Herbert O. Robinson inscribed a page at Black River, New York, on November 19, 1889. Minnie's mother Celestia A. 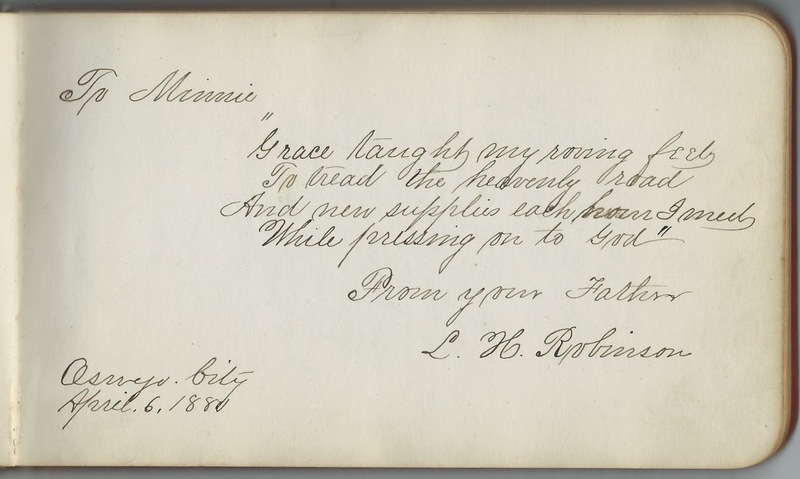 (Fassett) Robinson died in 1881, only months after she inscribed a page in Minnie's album. Minnie's stepmother, who I believe was Jane A. (Husted) Fister [or Finster] Robinson, inscribed a page at East Schuyler, New York, on September 17, 1889. By 1890, Minnie was a schoolteacher or Sunday school teacher at Black River, New York, judging from the pages signed by her "scholars". A Caple Keeler R ? Mrs. C. E. Barber of Watertown, New York, signed on "9-2-1889"
H. A. Carpenter, signed at Herkimer, New York. Presumably Methodist minister Herbert A. Carpenter. His wife Lizzie (Stevens) Carpenter signed the right facing page. Lizzie C. Carpenter, signed on November 6, 1882. Presumably Lizzie (Stevens) Carpenter, whose husband, Methodist minister Herbert A. Carpenter, signed the left facing page. Mary C. Child of Black River, New York, on February 11, 1890; "your loving scholar"
Eddie S. J. Child of Black River, New York, signed on February 11, 1890; "Your Scholar" I.O.G.T. L. Colson, signed at Batchellerville, New York, on July 28, 1885. Middle initial might be D or G or ? John M. Cory of Black River, New York, signed on January 30, 1890. His wife Ella R. (Roberts) Cory inscribed the right facing page. Mrs. J. M. Cory of Black River, New York, signed on January 30, 1890. 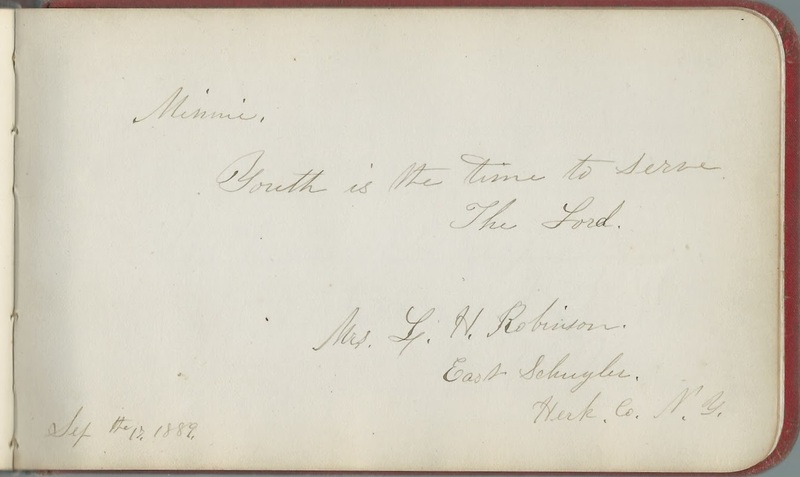 She was Ella R. (Roberts) Cory, whose husband John M. Cory signed the left facing page. M. Jennie Cory, signed on February 10, 1890. "I.O.G.T." Mrs. L. H. Johnson of Frankfort, New York, signed on March 7, 1881. 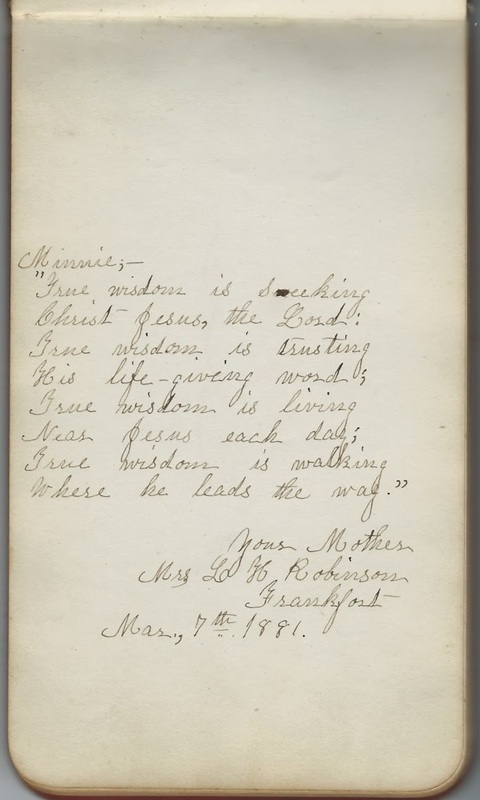 Minnie's mother Celestia (Fassett) Robinson, who would die not long after inscribing this page, on December 12, 1881. Mary A. Loomis; Minnie's aunt Mary A. (Barnaskey) Loomis, whose husband Wayland W. Loomis signed the right facing page. W. W. Loomis of Ingalls Crossing, New York. He was Wayland W. Loomis, whose wife Mary Ann (Barnaskey) Loomis signed the left facing page. Emma A. Runn*, signed at Syracuse, New York, on September 20, 1879. Surname could be Runnion or Runner or ? Minnie, album owner; presented by album by Louise on September 10, 1879. She was Minnie Robinson. Mrs. L. H. Robinson of East Schuyler, New York, signed on September 17, 1889. Minnie's mother Celestia A. (Fassett) Robinson died in 1881. Her father then married Jane A. (Husted), who I believe is the person who signed this page. She had previously been married to Ira Fister. Hi, I am a great granddaughter of Claude S. Robinson, a son of Lafayette and Celestia Robinson, Minnie's brother. I'm really excited to see something actually written by L.H and Celestia. We know very little about Celestia and I feel now like a little bit of her personality has been revealed. 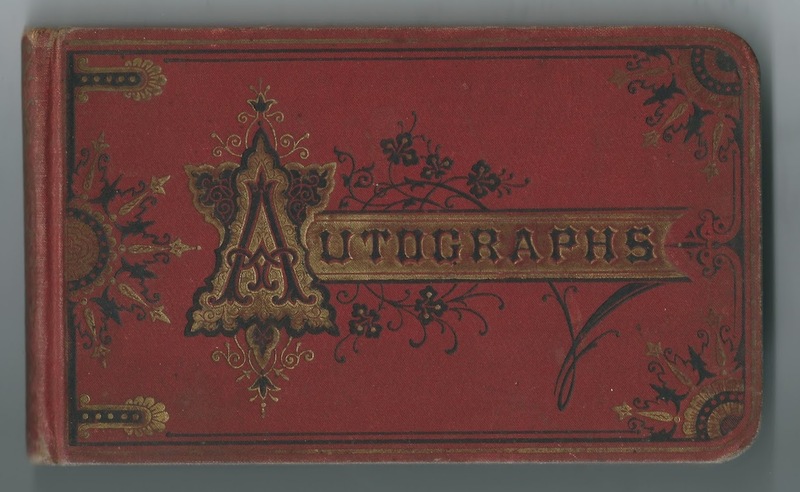 Do you think you would be willing to part with this autograph album. Please drop me a line and let me know. Thanks for sharing some of the album's entries, and best wishes.